Vacation destinations in New England – my personal experience being in Portland & Camden, ME, Cape Cod, Martha’s Vineyard – are some of the best places to get gifts and mine ideas for later on. The shops are niche, fun, well-curated and catering to people with good taste who want to burn some cash. Recipe for good stuff. 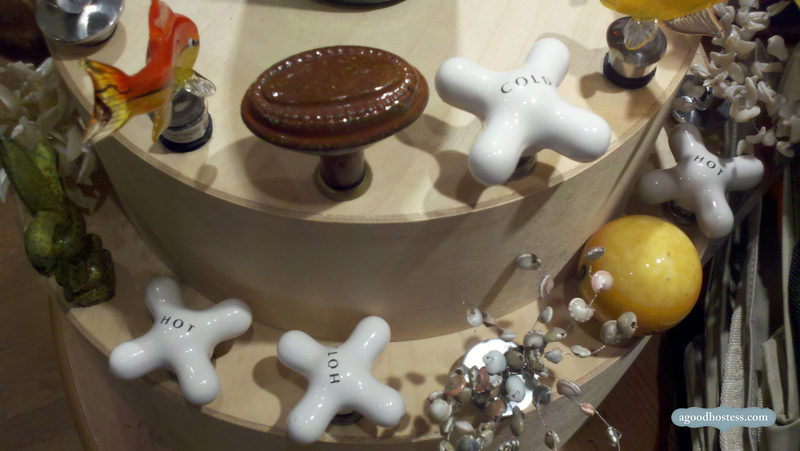 This year on vacation in Cape Cod, I stopped by Chadington’s on Commercial St (Provincetown’s main drag) and saw these funny bottle corks made out of old-school, reclaimed porcelain hot and cold faucets. Cute and fun, perfect for a gift. Now you may ask yourself as we have many times, does someone really need this adorable, kitschy but unnecessary item? Probably not, BUT some of the best gifts are frivolous ones. Do you really want your friends to think of you only in terms of practical gifts? I think that means you might need to loosen up. Or you talk about lack of money too much. Oops! So there’s our green light on fun, random gifting. Hot & Cold Wine Corks from Chadington’s on Commercial St. in Provincetown, MA.